Marcos Bish, Managing Director of Summertown Interiors, was proud to present the Workplace of the Year award to DHL Express at a glittering award ceremony at the Daman Corporate Health awards. 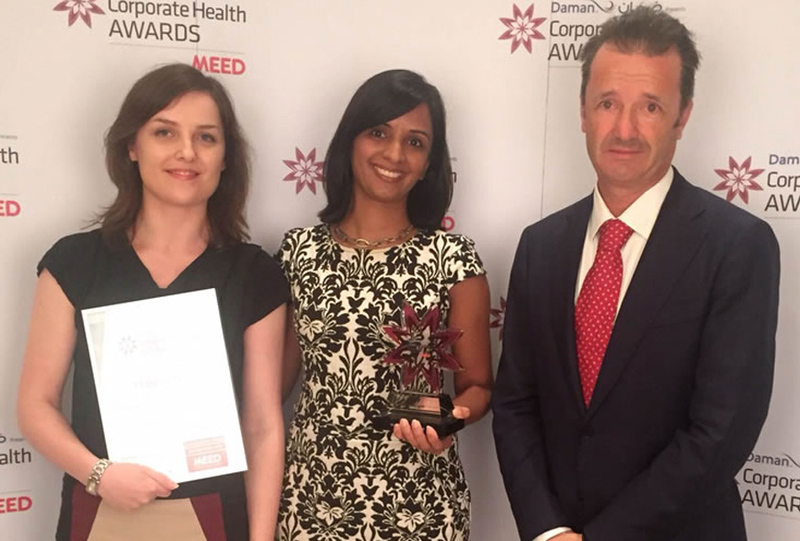 MEED, organizers of the prestigious event, launched the awards in 2013 to recognise organisations that have taken up the challenge to improve health and wellbeing of staff in the workplace. In 2014, Summertown Interiors received the CSR Engagement of the Year award in recognition for its efforts to integrate CSR into its business, particularly for how the company engages its staff across many initiatives as part of its CSR program. As a result, Marcos was invited to join the judging panel for the 2015 awards amongst leading personalities in the field including Dame Kelly Holmes, spokesperson for Daman and Great Britain’s Olympian and gold medal holder from the Summer Olympics in 2004. Marcos states “I was delighted to take part in the awards and it was a real honor to be invited to take part as a judge. It’s fantastic to see that health and wellbeing of employees is now so high on the agenda for many leading corporates, and the quality of entries was incredibly high”.